TORONTO, ON – On January 31, 2011 DCAM was selected as a finalist at the annual BILD awards. The entries were judged by an eminently qualified panel of professionals from across Ontario who were impressed as the competition was remarkably tight. 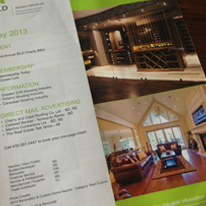 The presentation opportunity allowed DCAM’s Grandview House to be featured during the Toronto National Home Show.